Ferrari’s rookie driver, Charles Leclerc had a certain victory stolen away from him 10 laps from the end of the race when his MGU-K failed on him, meaning he lost the 160 horsepower boost from the battery energy recovery system, costing him 1.5 seconds a lap, leaving him helpless as Lewis Hamilton, then Valtteri Bottas closed the gap and passed, demoting him to third by the time the chequered flag fell. Back to the start of the race, Leclerc got a bad start allowing Ferrari teammate Sebastian Vettel to get ahead through turn 1, then lost out to Bottas, who got the better of his Mercedes teammate, Hamilton off the line, moving into third place, giving him the opportunity to attack and pass Leclerc through turn 4. After a scrappy first lap, Leclerc fought back to pass Bottas on lap 2, getting better drive off the exit of turn 1 through turns 2 and 3, to make the pass into turn 4 to move back up to 2nd place. This put Bottas on the back foot, allowing Hamilton to retake 3rd back from his teammate through turns 5, 6 and 7. Leclerc made significant inroads into his teammate’s lead, to be in a position to overtake by the start of lap 6, Vettel defended by moving to the right to cover the inside of turn 1, but Leclerc was faster, driving around the outside of turn 1 to regain the lead, where he remained until his Ferrari MGU-K failed. During the first round of pitstops, Hamilton tried something different, putting on another set of soft tires, while the other frontrunners, moved onto medium tires. Which really did not work out well for Hamilton due to the high degradation nature of the Sakhir tarmac. 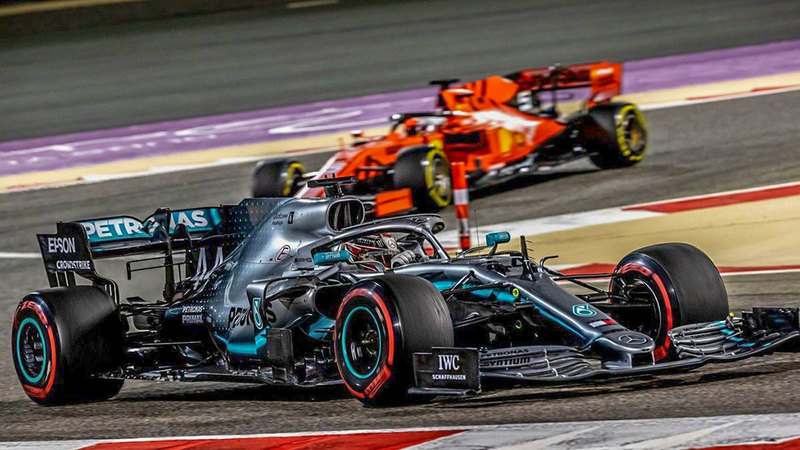 Leclerc was pulling away from the British driver, while Vettel caught and passed Hamilton for a Ferrari 1-2 running order on the 23rd of 57 laps. Later, during the second round of pitstops, Hamilton switched to the medium tire, and suddenly his car came alive and on lap 38, Hamilton made the pass on Vettel through turn 4 to move up to 2nd place. Not only did Vettel get passed by Hamilton, but he also had a spin as he got back on the power, then later on the same lap, lost his front wing underneath his Ferrari, causing him to drop back to 9th after a pit stop. Vettel fought back to 5th place, while his Maranello stablemate dropped to 3rd place and was saved from falling off the podium by a double retirement for the Renault drivers, both cars having catastrophic failures at turn 1 on lap 55, which caused a safety car period to recover the two Renaults, that ran until the chequered flag, meaning that Red Bull’s Max Verstappen could not claim the final podium spot. Charles Leclerc deservedly won the driver of the day vote and the fastest lap point. Leclerc is a clear future world champion if he has reliable machinery to power him to a world drivers title. You have to be impressed with his driving and maturity, he didn’t lose his head after his scrappy first lap to fight back, and after the race, his pragmatic response while talking to Martin Brundle was mature beyond his years.